Track racing as a sport was developed at the end of the nineteenth century with the first World Championships held in 1893. Track racing is particularly exciting and with some characteristics even more difficult than road racing. Because of this track cyclists are powerful athletes with more muscle bulk than other cyclists. Championships have ten events which are divided into three families – Sprint, endurance and combined events. Sprint events include categories such as individual sprints for both men and women, team sprint and keirin which are part of the Olympic program, and kilometer for men and 500m for women. An individual sprint is a short-distance event with two contestants in 3 laps. Qualification starts with a 200m time trial. Then there are knockout heats where the fastest competes against the slowest. This event is all about tactics. Riders often come to a standstill to make their opponent take the lead, which is the least preferred position before the final sprint. Team sprint includes three riders over three laps of the track for men and two riders over two laps for women. In this category, two teams start on opposite sides of the track, with each rider leading for a lap before they peel off in the 50-meter peel off area. The last rider for each team sprints for the finish to establish the team’s time. 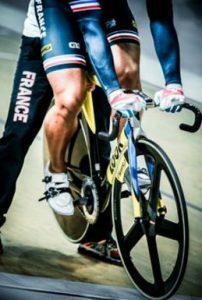 When it comes to keirin category, riders follow the pacing motorbike for several laps, or 750 meters to be exact before they start a three-lap sprint. As motorbike in front increases the speed, so do the riders. These events include individual pursuit, team pursuit, as well as madison, points and scratch race. Individual pursuit has two riders on opposite sides of the track who compete for over 4 km, or 3 km when it comes to women. The winner is the rider who catches their opponent or has the fastest time. It is the same with team pursuit, although there are two teams with four riders in this case. The points race is a mass start race of 25 km for women and 40 km for men. Points are won during the sprints and by lapping the rest of the field. The winner is the one who gains the largest number of points. Madison is a category which includes teams of two riders who participate in a relay race. This event just like points race has certain points for particular actions. Scratch race is also a mass-start race for individual riders over 15 km for men and over 10 km for women. Omnium belongs to the Olympic program, and it is made of made of 6 events which can last for two days. Omnium this year will include four endurance events on the same day such as scratch race, tempo race, elimination, and points race. Here, riders need to show their consistency in different categories. The new omnium will include the new element called tempo race, which has the similar rules as the points race.